Tony Prosdocimi lives in the bustling Metropolis of San Ventura - a city gripped in fear, a city under siege by the hooded supervillain, The Cowl. Adam Christopher was born in Auckland, New Zealand, and grew up watching Pertwee-era Doctor Who and listening to The Beatles, which isn't a bad start for a child of the 80s. In 2006, Adam moved to the sunny North West of England, where he now lives in domestic bliss with his wife and cat in a house next to a canal, although he has yet to take up any fishing-related activities. "A blast of pure pleasure. This is Watchmen meets NYPD Blue, while The Incredibles stroll by; fast-moving action infused with Christopher’s infectious love of pulp fiction and the superhero genre." "Superheroes, we’ve always been told, are far above the common man in both powers and nobility, but Adam Christopher unrelentingly tells the story of heroes struggling to guide the world long after they’ve lost their own way. 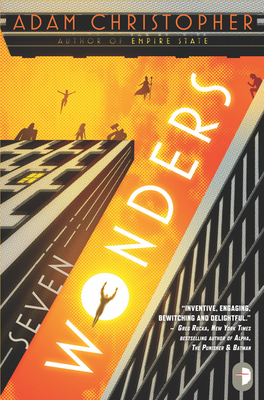 Seven Wonders slams readers in the gut from the very first page and then just keeps on firing cannons, giving readers the same choice as every single citizen of San Ventura… either duck and cover, or ride along with the laser."